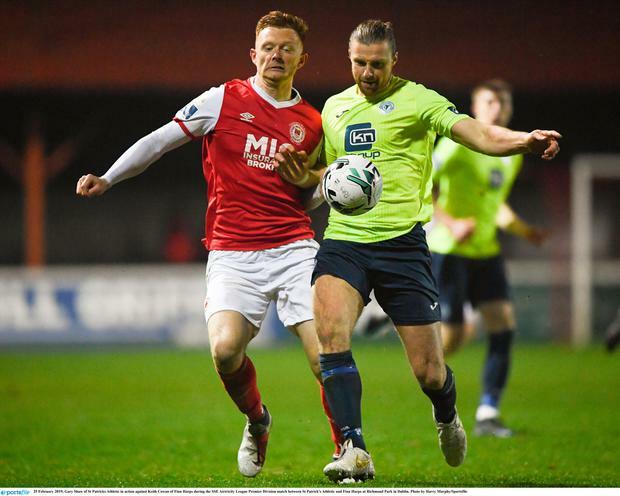 Newly-promoted Finn Harps frustrated St Pat’s at Richmond Park to earn their second big point in four days. Front two Nathan Boyle and Sean Boyd combined with the latter’s drive being deflected out for a corner. St Pat’s upped the tempo from the restart with Mikey Drennan turning to fire a shot narrowly wide. Despite Brandon Miele and Chris Forrester being introduced to try to liven up St Pat’s attack, chances remained at a premium. A clever Conor Clifford ball found the run of Drennan down the inside right channel on 72 minutes. His shot found the side netting to just about sum up St Pat’s night. Harps might have snatched it in stoppage time, but Daniel O’Reilly’s powerful header was straight at Brendan Clarke. St Pat’s – B Clarke; Webster, Toner, Desmond; Madden, McCabe (Forrester, 70), Clifford, Lennon, Kelly (Doona, 82); Shaw (Miele, 60), Drennan. Finn Harps – Burke; Borg, Todd, Cowan, O’Reilly; Kavanagh, McGinley (McAleer, 79), Harkin, Coyle; Boyle (Cretaro, 67), Boyd (Place, 85). Referee – G Kelly (Cork). CORK City finally got their season up and running with a hard-fought win at The Showgrounds. Goals in each half from Sean McLoughlin and Gearoid Morrissey earned a first win in three games for John Caulfield’s men, although they were made to sweat when Sligo pulled a goal back through Kyle Callan-McFadden. Both sides were winless ahead of this encounter. Cork, in fact, were second from bottom in the Premier Division table after two losses. Cork broke the deadlock and ended their scoring drought after 14 minutes when Shane Griffin flighted in a corner and centre-back McLoughlin got the vital touch. Sligo got into the game after going a goal down – Romeo Parkes showing some nice touches – but they didn’t test Cork goalkeeper Mark McNulty. A brilliant finish from Morrissey put Cork 2-0 ahead in the fourth minute of the second half. But Sligo battled and Callan-McFadden’s firm header, from a Jack Keaney corner, halved the deficit after 63 minutes. Sligo Rovers – McGinty; Banks, Leverock, Mahon, Donelon (Morahan 7); Keaney, Callan-McFadden; Fordyce (Warde 65); Twardek, Kerrigan (Cawley 65), Parkes. Cork City – McNulty; McCarthy, Casey, McLoughlin, Griffin; McCormack, Morrissey; O’Connor (Tilley 69), Buckley, Sheppard; Nash (Smith 69). Derry City held on to see off Waterford at the end of a thrilling encounter at the Brandywell last night as two own goals proved to be the visitors’ downfall. Zachary Elbouzedi missed a great chance to give Waterford the lead on 12 minutes as he went through on goal only to see his effort saved by Peter Cherrie. Derry took the lead within seconds, Junior Ogedi-Uzokwe finding Ciaron Harkin who swept home brilliantly from the edge of the area. They should have doubled the lead 10 minutes before the break when Barry McNamee played David Parkhouse through on goal but the striker could not beat Matt Connor who saved well. Waterford drew level on the hour mark when Darren Cole fouled Bastien Hery in the box. Shane Duggan stepped up and rolled the ball past Cherrie. The game swung back in Derry’s favour with just 15 minutes remaining when Patrick McClean’s sensational cross from the left was put into his own net by Rory Feely. Five minutes from the end Derry benefited from another own goal, Harkin’s cross turned into his own net by Georgie Poynton. But Waterford ensured a nervy finale when Cory Galvin found the net from 30 yards. DERRY CITY – Cherrie, Cole, Toal, Gilchrist, McClean, Sloggett, Harkin (Bruna 87’)McNamee, McCrudden (Delap 70’) Parkhouse, Ogedi-Uzokwe. Waterford – Connor, Feely, Lynch (Poynton 30’), Duggan, Browne, Lunney, Drinan ( Akinade 63’) Twine (Galvin 57’), Elbouzedi, Delaney, Hery.